Give your team's palette a treat and play with the “food of the gods” in this unique teambuilding event! Start with the manic fun of Full Contact Chocolate Bingo. Once your team is energized, it's time to test your taste buds and childhood memories with our unique “CSI Chocolate investigation. Then test your problem solving and innovation skills in Towering Chocolate. Now the grand finale - a wild building event! Help Charlie build a Bridge Over Chocolate Waters for Wonka Inc.
Everyone is given a Bingo card with chocolate experiences such as “has eaten the ears off a chocolate bunny first” and “has eaten cereal with chocolate milk” on a grid. Find others who fit these descriptions, write their names in the appropriate boxes and get Bingo before your coworkers do! Each Bingo wins chocolate you can use later to purchase materials at our ‘chocolate store’ for the Bridge Over Chocolate Waters competition. This is a perfect energizer to get people up, moving around and most importantly, meeting co-workers, talking with them, and finding out interesting things about them. It’s time to treat your sweet tooth and test your taste buds with our unique CSI “Chocolate Taste Test” competition. Each group gets tries at tasting ten different types of familiar childhood favorites – can you guess what they are without looking at them? Whose taste buds will reign supreme? But that’s not all. In our “Chocolate Sight Investigation” (CSI) we’ve dissected chocolate bars. Can you correctly sleuth out what kind it is? Every right answer earns you chocolate you can use later to purchase materials at our ‘chocolate store’ for the Bridge Over Chocolate Waters competition. You’ve got chocolate and you’ve got the brains, creativity and project management skills. Now it’s time to put your skills to the test and see how high you can build a freestanding chocolate tower. Timing is everything in this hilarious head-to-head competition! 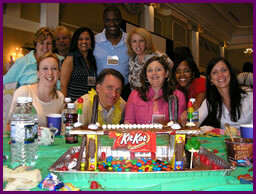 Each team receives 10 bars of chocolate and ten minutes to build. Fast-moving fun. Willy Wonka has retired and Charlie’s factory is in big trouble. Charlie knows he has the most popular and powerful chocolate factory in the world, but he needs your help to get his chocolate to market. Enter a world of pure imagination as you design, build and pitch a scrumdiddlyumptious bridge made of chocolate that will transport the latest Wonka candy sensation! Each team competes for the honors of best-built bridge for Wonka Inc. A discerning team of judges score teams on their bridges in a variety of categories – half of which are literally ‘measurable benchmarks’ (there’s even a weight test! ), and half of the categories are based on each team’s presentation. Winners get a prize and bragging rights until next time. Teams are given basic building supplies (popsicle sticks, etc.) They are also given a list of requirement for the bridge such as height and length. A team ‘buyer’ takes the chocolate they have won in the previous games and goes to the candy store to purchase the different types of chocolate and candy that they hope will make their bridge sturdiest and most beautiful. Each team also has an opportunity to perform a ‘team commercial’ at the end (if desired). This program includes a debrief by a trained facilitator. The debrief can be customized for your group goals. One to two hours (two hours is ideal) A 45 minute to an hour chocolate tasting can be added to this program for a delicious beginning or end.